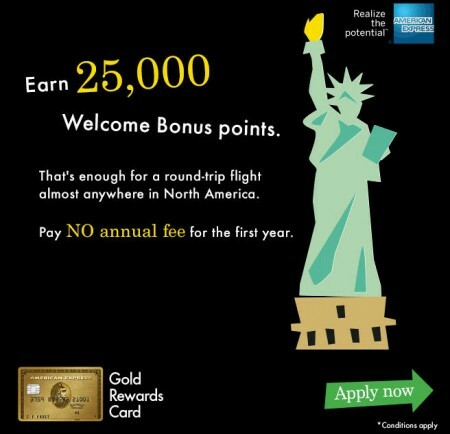 TRAVEL HACKING: American Express Gold Rewards Card – Get 30,000 Points = FREE Flight to Anywhere in North America! UPDATE: For a limited time, American Express has increased the Welcome Bonus from 25,000 points to 30,000 points! If you haven’t started Travel Hacking yet, make this the year to start. You’ll be glad you did. It’ll change the way you travel forever. Travel Hacking is the art of collecting miles and points to get free flights, hotels, and more. Checkout my new travel site RayTravelsFree.com for more travel hacking tips and deals. This is my all-time most popular post! Lot’s of people have taken advantage of this incredible offer so don’t miss out! The American Express Gold Rewards Card is the #1 Best and Most Flexible Travel Rewards Credit Card available today. I’ve been blogging deals for a long time and this one of the best freebies and travel offers that I’ve ever seen! This is only the second travel rewards card that enticed me to sign-up and share with my friends and family. For a limited time, sign-up for the American Express Gold Rewards Card and get a phenomenal 30,000 Free Welcome Bonus Rewards Points! That’s enough points for a round-trip flight to almost anywhere in North America, or 2 round-trip short haul flights! American Express is also waiving the annual fee the first year ($150 value) which means there’s zero cost to you, making this an unbelievable freebie! All you have to do is charge $1,500 in purchases to your card within the first three months of card membership to get the 25,000 welcome bonus membership points. Plus, you’ll get an additional 5,000 rewards points when you add a Supplementary Card to your account at time of online application (fee waived the first year – $50 value) for a total of 30,000 rewards points. If you don’t like the card, you can cancel the card at any time without penalty and keep your points. AMEX Membership Rewards points are very flexible and can be transferred one-to-one to Aeroplan or a bunch of other loyalty programs. Here’s a full list of all the Loyalty Programs that you can transfer your points to. Get 30,000 free Welcome Membership Rewards Points! That’s enough points for a round-trip flight to almost anywhere in North America (up to $550 value)! Or save up more points and travel to other destinations for free! See where else you can fly with Flight Reward Chart. The first year is absolutely free ($150 value), so if you decide the card is not for you, just cancel it and get keep the 30,000 free bonus points! You can cancel the card at any time without penalty and keep all your points. Earn one point for every $1 in card purchases, and earn double points on eligible travel and everyday purchases (Ie. gas, grocery, drugstores, and all travel purchase). Transfer your points to frequent flyer programs, or one-to-one to Aeroplan and Avios. If you consider all the points, this is a deal you can’t ignore! Worst case, you take the 30,000 free points and cancel the card before the first year. Click here to get your FREE 30,000 Membership Bonus Points and start Travel Hacking now!